After you've scoured your favourite Farmer's Markets and produce stores to find the most stunning cheeses to serve to your guests, it's only fitting that the board you serve them on should also be a work of art. 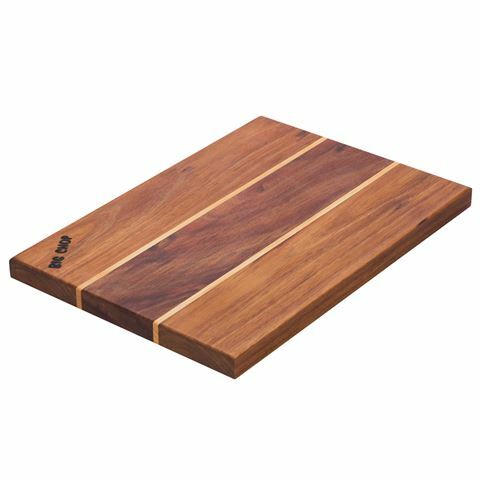 This beautiful Cheese Board composed of rich brown Myrtle with pale yellow Celery Top Stripe from The Big Chop will soon inspire even more expeditions for suitable artisan cheeses to place on it along with the most interesting dried fruits and crackers. You'll want it to look organic to match your board. Tasmanian craftsmen construct each unique board from hand selected timbers, ensuring this small but sustainable supply of native timber is available for generations to come. Durable and heavy enough to have a commanding presence on your table or sideboard, it will last throughout a lifetime of dinner parties. .
Big Chop turns every meal into a stylish ritual. Handmade in Australia from Tasmanian timbers. Real timber boards have natural anti-bacterial properties.